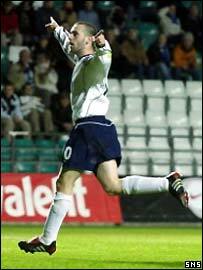 A virtuoso goal by James McFadden 14 minutes from time gave Scotland a deserved victory over Estonia. The Scots dominated the first half, with Gary Caldwell's header off the bar the closest thing to a goal. The home side came back into the match after the break but Paul Gallacher made three excellent saves. McFadden finally broke the deadlock when he beat three players before driving a shot past Estonia keeper Martin Kaalma from the edge of the box. Malky Mackay was first to hit the target when he got on the end of a Darren Fletcher free-kick, but Estonia keeper Martin Kaalma was behind his low header. Kenny Miller was sent clear by Gary Caldwell, but Kaalma made a fine block to keep the scoreline blank. 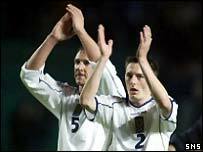 Scotland were on top and McFadden saw an effort deflected over and, from the corner, Gary Holt saw a drive fly inches past the goalkeeper's right-hand post. At the other end, Paul Gallacher had to make his first save of note in the 32nd minute when a fine passing move that saw Andres Oper and Sergei Terehhov combine before the keeper blocked low down in his six yard box. Kristen Viikmae missed a great chance when he was put in on goal by Terehhov only to loft the ball over Gallacher and beyond the far post. The Scots replied by almost taking the lead at the other end when Caldwell sent a header thumping off the bar, with Kaalma appearing to get a touch to the ball. Miller was again denied by a fine save from Kaalma at the beginning of the second half after McFadden set him up. The Wolves striker was also on the end of the resulting corner and when his header was only half blocked it seemed that Richard Hughes would mark his debut with a goal, but instead he blazed over with the goal at his mercy. Miller failed with an attempted lob after Fletcher had set him up with a fine run into the box and then McFadden had the ball in the net only to be ruled offside. But McFadden did make the breakthrough after 76 minutes with a fabulous goal, beating three players before curling the ball beyond Kaalma from the edge of the box. Minutes later he was denied a second when a superb run and shot was matched by the save from Kaalma. Scotland held on comfortably for a deserved win, with manager Berti Vogts able to take encouragement from assured debuts by Nigel Quashie, Richard Hughes and David McNamee. Estonia: Kaalma, Allas, Stepanov, Jaager, Klavan, Rahn, Reim, Viikmae, Terehhov, Oper, Lindpere (Kink 75). Subs Not Used: Kaas, Reinumae, Saharov, Saviauk, Kristal, Zahovaiko, Teever, Grub, Post. Scotland: Gallacher, McNamee, Pressley (Webster 46), Mackay, Hughes, Gary Caldwell, Holt, Quashie, Fletcher, McFadden (Kerr 89), Kenny Miller (Crawford 79). Subs Not Used: Gordon, Stephen Caldwell, McAllister, McCulloch, Shearer.